I recently took a long weekend trip, with my spouse, to the Charlotte North Carolina area for the World Finals at the Dirt Track at Charlotte Raceway. At 4:30 am we were on the road and ready for our 10 hour drive. My husband and I have been to over 100 tracks around the US and we had tried for years to attend the races in Charlotte together. This year, we were finally able to make the trip happen. 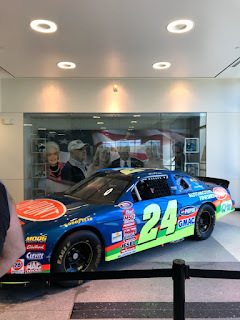 I had such a wonderful time on our trip and explored so many different museums, race shops and tracks in the Charlotte area. 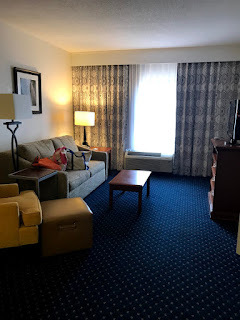 First of all, I would like to say that we stayed at the Hampton Inn and Suites in Concord and we had such a wonderful stay there. 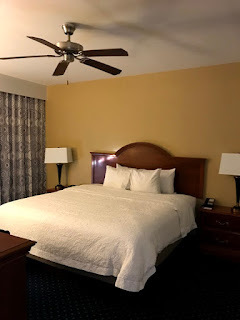 The hotel was very clean and the staff was very friendly and professional. We had a beautiful suite with a full kitchen, living room, large bedroom with king size bed and whirlpool. 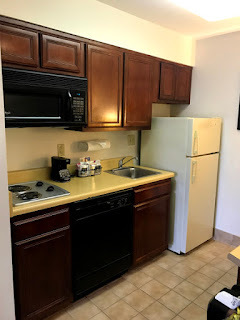 We received a complimentary breakfast every morning and free WiFi in our room. 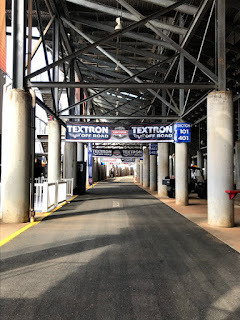 Our first stop on our trip to North Carolina was to the Dirt Track at Charlotte Motor Speedway. 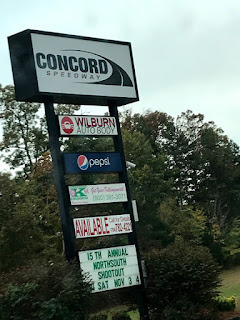 As soon as we arrived in Concord, we walked around and checked out the track. I decided to take some photos of the track while it was empty, because I wanted to see the calmness of the track before the excitement began. It really is a beautiful track and we easily got in and out of the facility with no traffic. After a 10 hour drive, we were both pretty hungry. 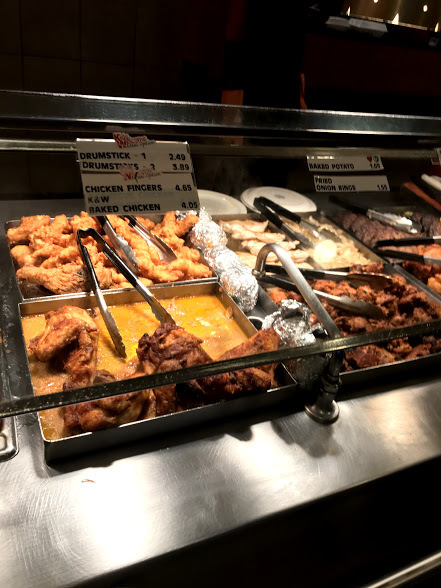 I had looked forward to visiting K and W Cafeteria Restaurant, a place I had visited years ago when we visited friends in Matthews, NC. The food there is fantastic. 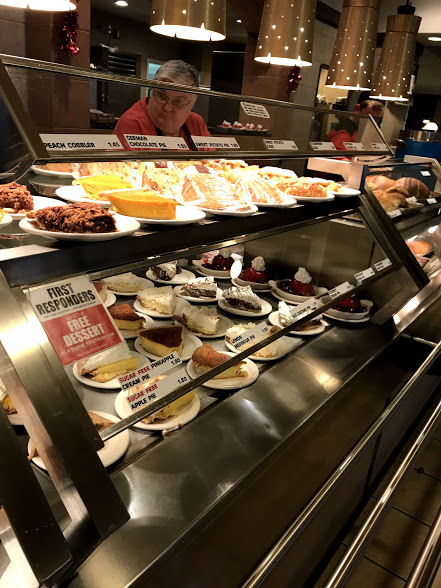 It is all made from scratch from the appetizers to the desserts. 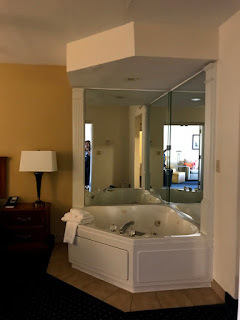 I was delighted when we got there. We decided to try a few different dishes. We were both starving. We tried the salisbury steak, chicken steak with stuffing, the cranberry mold, ham, mac and cheese and a side of mashed potatoes. For dessert, we decided to share a big piece of coconut cream pie. 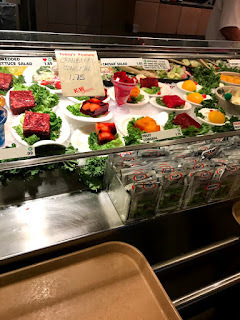 Everything was delicious! 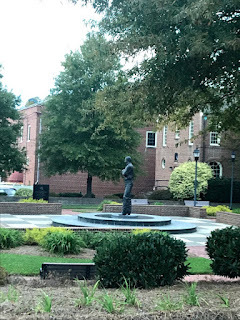 Our next stop was Kannapolis. 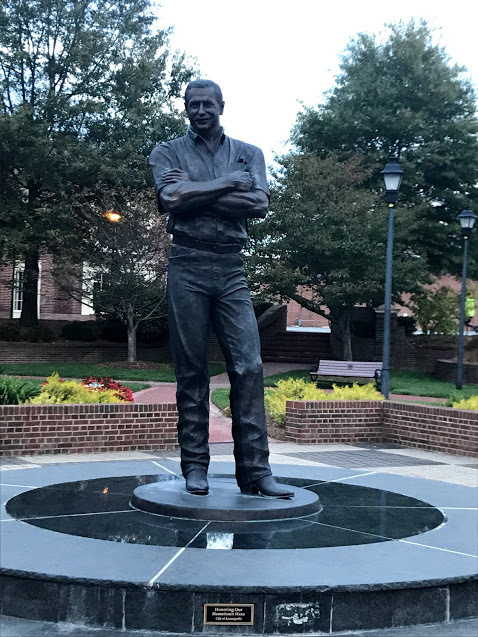 Kannapolis is a beautiful town that was the boyhood home of Dale Earnhardt Sr. We decided to drive the Dale Trail. 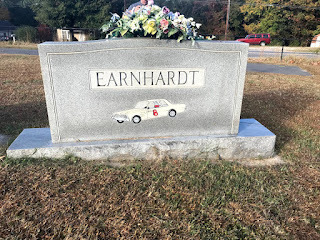 It is a trail that took us to the boyhood home of Dale Sr., the cemetery of Ralph Earnhardt, his father, and to the tribute statue of Dale Sr., that is located in a small park near the college on South Main Street. The statue stands tall and the park is beautifully manicured and well kept. 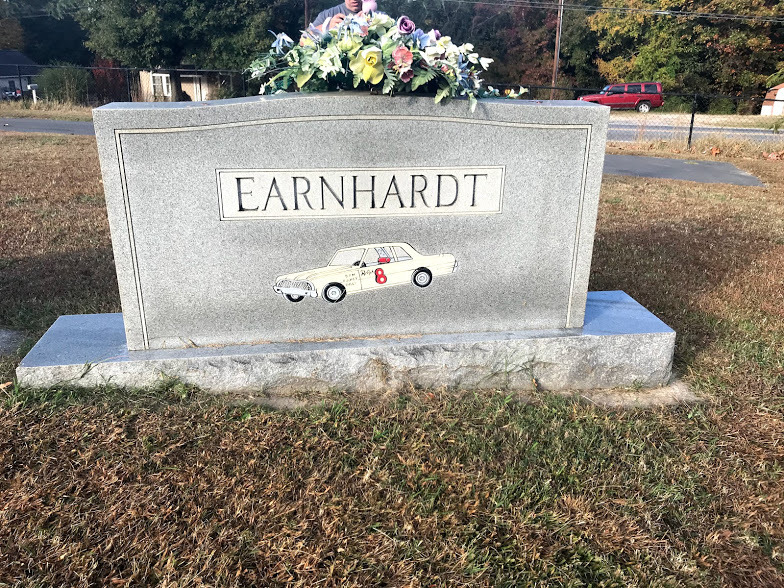 A beautiful monument stands nearby that also pays tribute to Dale. 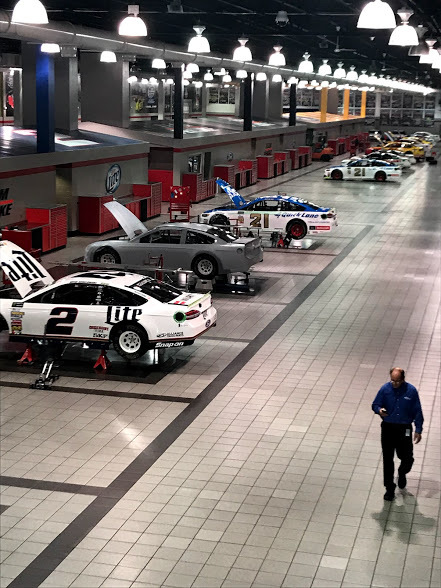 The following morning, we decided to visit some of the race shops in Mooresville, which are about 20 minutes from the Charlotte Speedway. 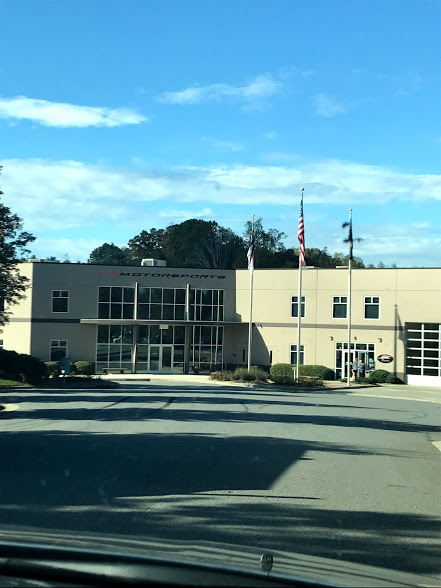 Our first stop was JR Motorsports, the home of Dale Jr's race teams. There we saw the race shop and souvenir store. I liked that all of the products were priced with .88 at the end of the price tags. 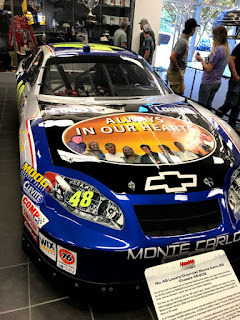 A tribute to Dale's car number. There is a radio studio in the shop and glass windows that allowed us to see the cars being worked on. 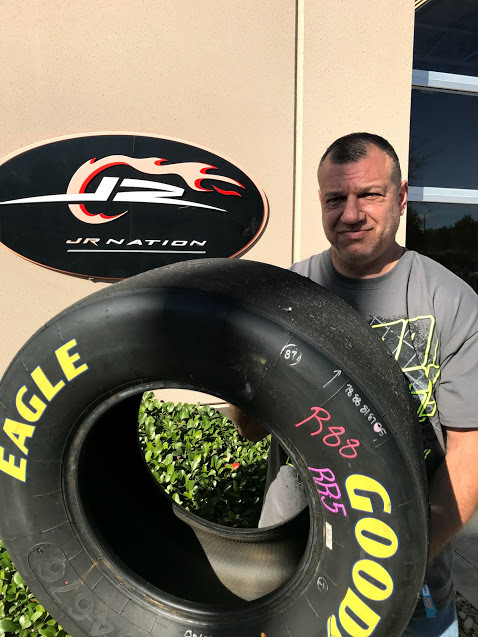 We purchased one of Dale's used tires in the gift shop for $20. We plan on making it into a coffee table for my husband's man cave. 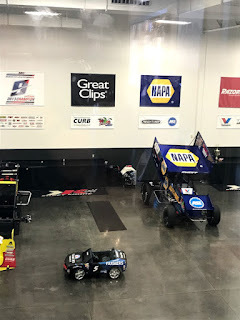 A bit down the road, we stopped at Kasey Kahne's sprint car shop. 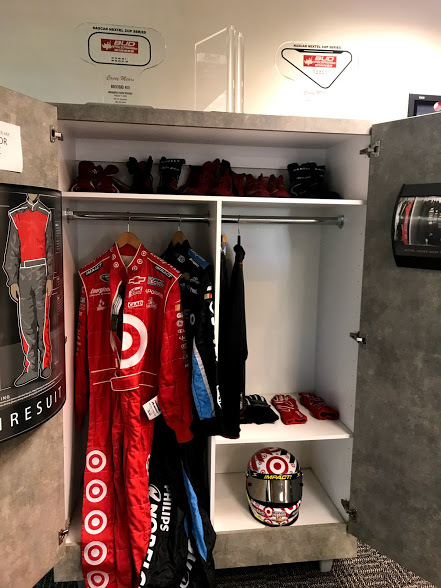 There we saw a display of all of Kasey's and his sprint driver's trophies. 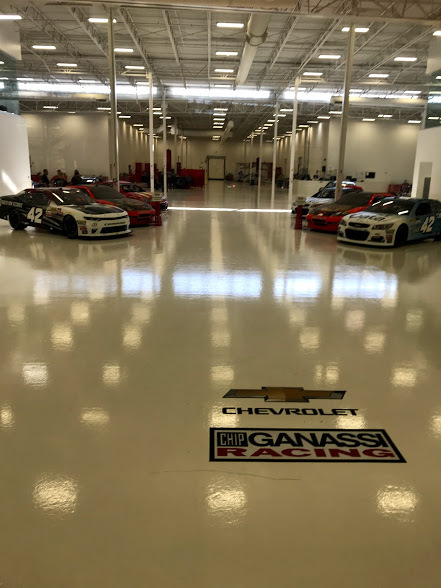 We also saw all of the chassis and cars that the crew was working on, as well as cars that Kasey once drove. 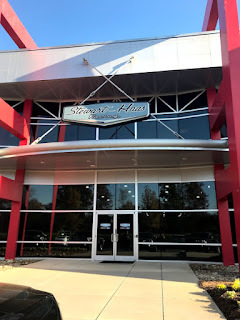 Next, we stopped at Martin Truex's Racing shop which was right down the road from Kasey's shop. Martin's shop was adorned with many of the trophies he has won, as well as the go-kart he drove as a child in my home state of New Jersey. 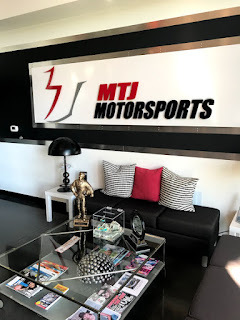 This shop was extra special for us to visit, because we are huge Martin fans and use to watch him race locally, here at Wall Stadium in New Jersey. 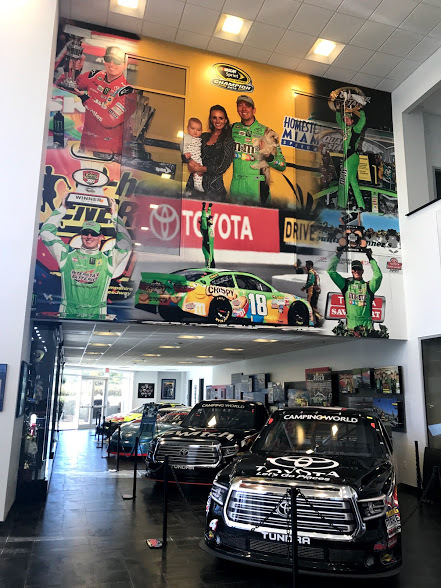 I was humbled by the display of the Martin Truex Foundation and SherryStrong.org, two foundations that support ovarian childhood cancer. I picked up a tee and pin to support both Martin and the foundation. After leaving Martin's shop, we drove over to Kyle Busch Motorsports. His shop is beautiful. He had many of his cars on display, including the Legend car that he drove when he was young. I also saw his first late model, which was on display. 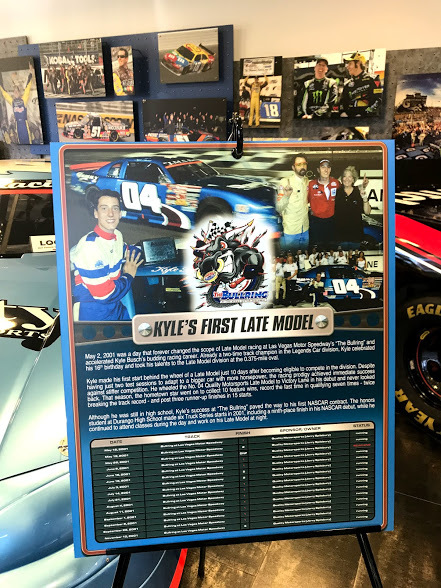 There were so many trophies on display in Kyle's shop. I was really in awe at all of his accomplishments. 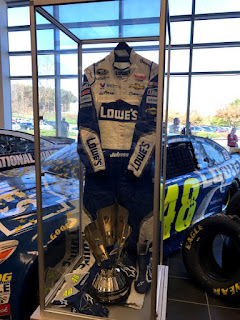 Hanging high on the wall were many of Kyle's uniforms that he has worn over the past years. I got a free bite size piece of chocolate from the MMs statue on the way out. 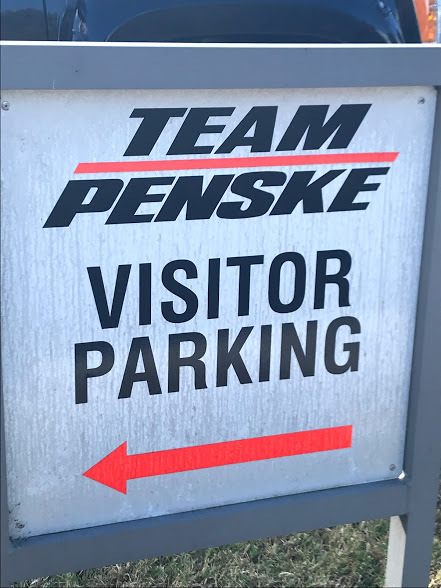 Our final stop of the day was Penske Motorsports. 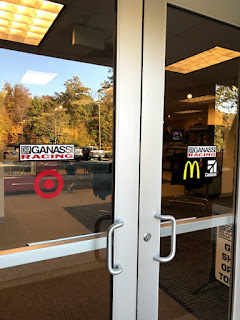 This shop is one that was on my bucket list. 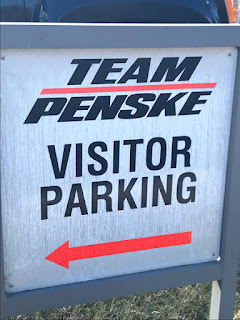 I have often interacted with the PR social media reps from Penske and have found them to be very kind. 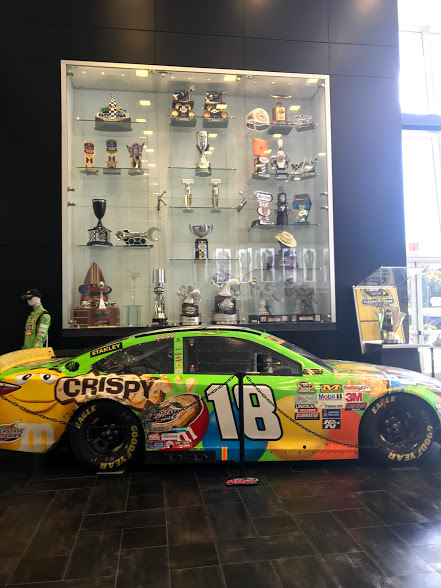 This peaked my interest in the team and from there, I became a bigger fan. 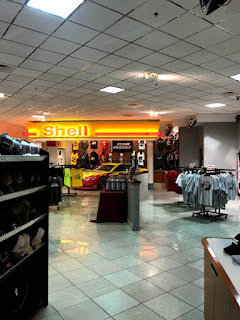 The shop was remarkable. 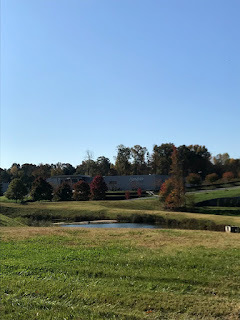 The grounds were huge and the size of the shop is unbelievable. 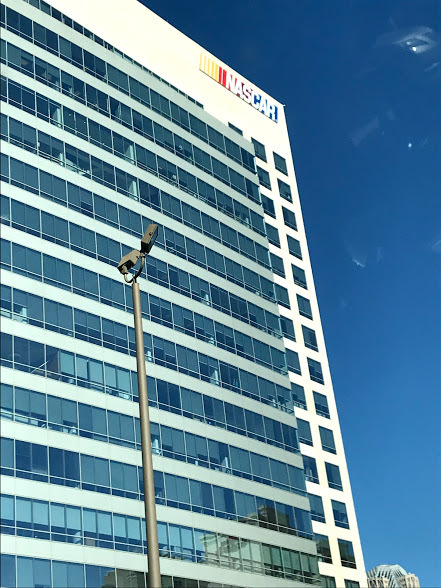 We were able to go up the stairs and walk along a balcony type platform which ran the entire length of the building and overlooked the work areas of the Nascar team cars. The Indy cars and sport cars are also maintained at the shop but are kept separate and are not in plain view. In the distance of the shop I was able to see rooms that are geared toward fabrication, paint, etc. 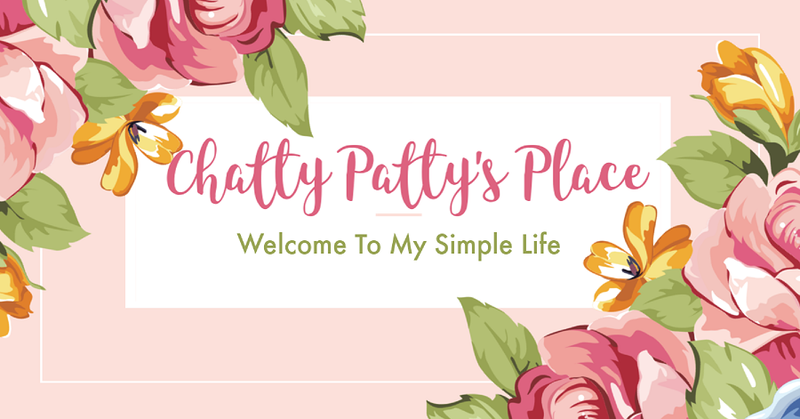 If you are ever in the area, I highly recommend a visit. The gift shop was adorned with trophies and souvenirs from the many teams that are sponsored by Penske. 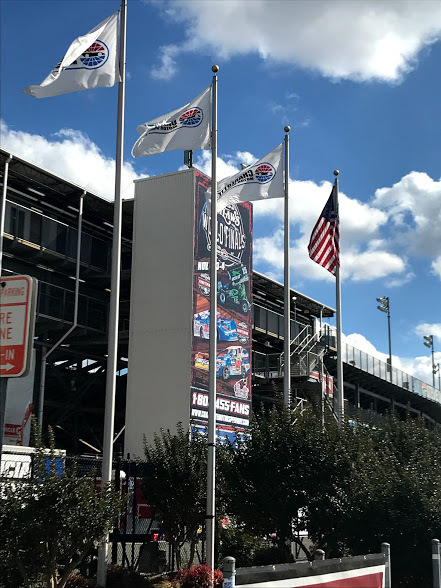 After a long day of visiting these shops, we made our trek back to the Dirt Track at Charlotte for the World Finals. Afterall, this is the main reason we were visiting. 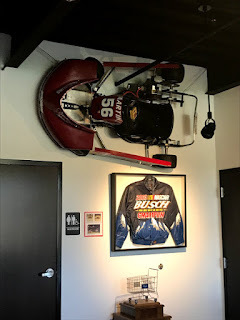 My husband had been to this track a few years back with a bunch of friends. At the time, our son was too young and in school for me to leave and travel along with him. 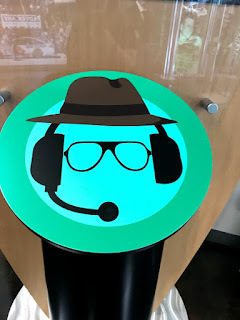 He had often promised to take me here one day to see the races. That day was finally here. 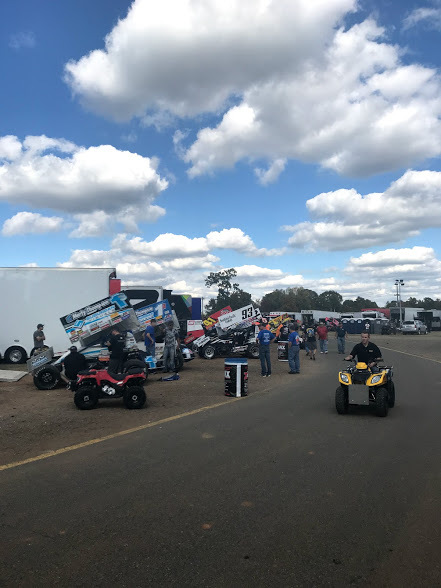 The pits were jam packed with cars from some of the top sprint, dirt modified and late model drivers in the country. I could feel the excitement in the air. 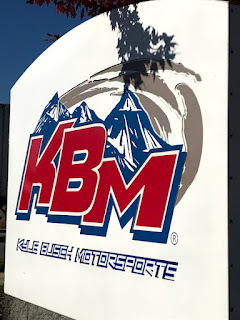 I have to be honest, my adrenaline was pumping at the sound of the revving motors and the smell of methanol. 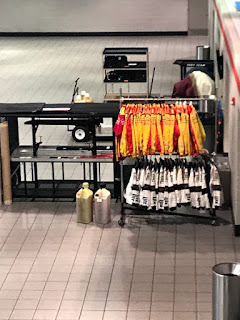 We spent a couple of hours in the pits walking down each row and watching all the mechanics and teams work on the cars. We ran into some of the people we know from local tracks, including my friend Dana Kinser who I got to know over all of the years that we have been attending racing. For the first night of qualifying, we decided to watch the racing from the pit grandstands. The view was great and we were able to be up close to the cars as they were set to roll onto the track for qualifying. 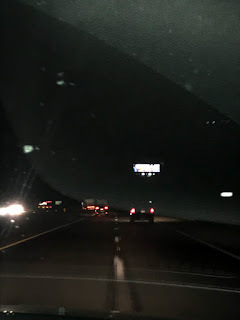 I was able to get some pictures with my iPhone, but was a bit disappointed that I had forgotten to pack away my camera for my trip. The grandstands were pretty packed for the first night and everyone seemed to be having a great time, despite the fact that there was dirt raining down on us all. 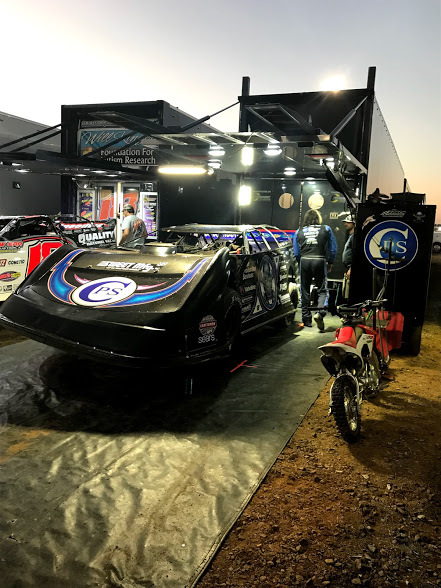 Like us dirt racing fans like to say, "if there isn't dirt in your beer, you aren't at a real race." Good morning! 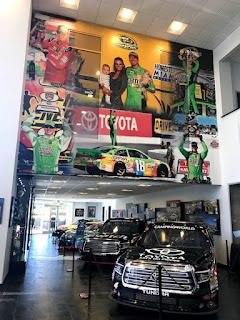 Today we decided to visit more of the race shops in the area. Our first stop was back to Kannapolis to visit the Stewart Haas Racing shop. 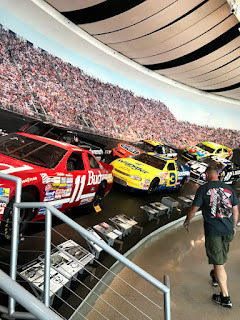 There we got to see cars that were driven by Kevin Harvick, Kurt Busch, Clint Boyer and Tony Stewart. 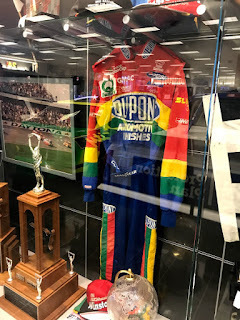 There were many trophies and photos on display in the shop and we could watch the cars being worked on through a glass window. 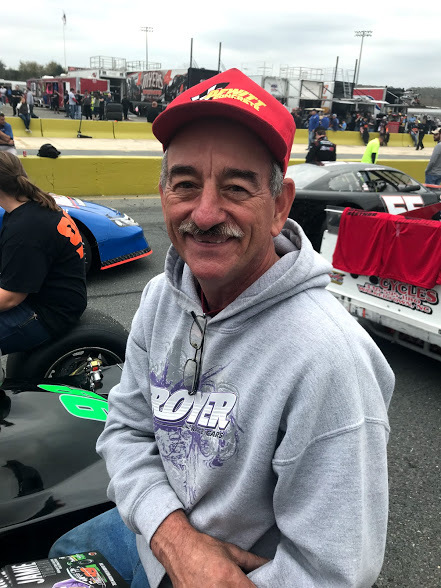 Tony is one of our favorites because we watched him come up through racing since he was a little boy. 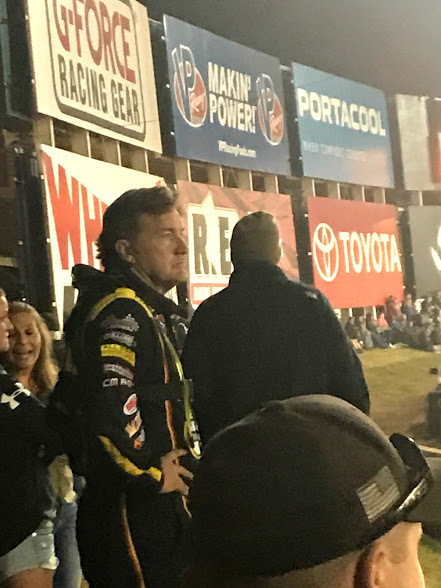 I can remember watching him race midgets at Richmond when he was a teenager. I also appreciate the fact that he has done so much for my favorite type of racing, which is sprint car racing. 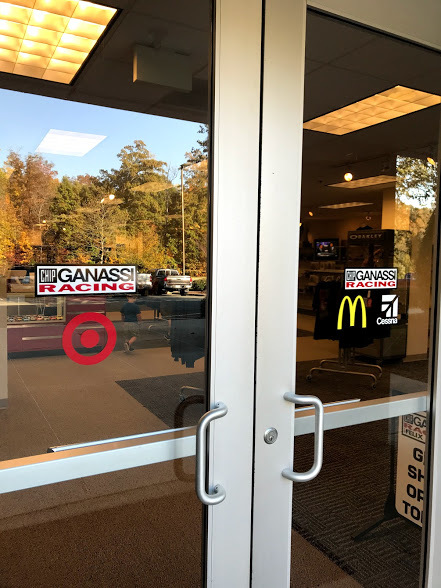 Our next stop was Ganassi Racing, home of the Nascar teams Kyle Larson and Jamie McMurray. 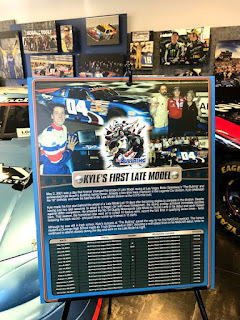 Kyle is another one of our favorites who we watched grow up racing. He too does a lot for sprint car racing, just like Tony Stewart. The shop was filled with trophies from the Nascar and Indy teams owned by Chip Ganassi and we were able to see some of the cars on display through glass walls. 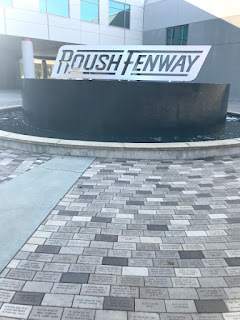 After leaving Ganassi Racing, we visited Roush Fenway Racing. 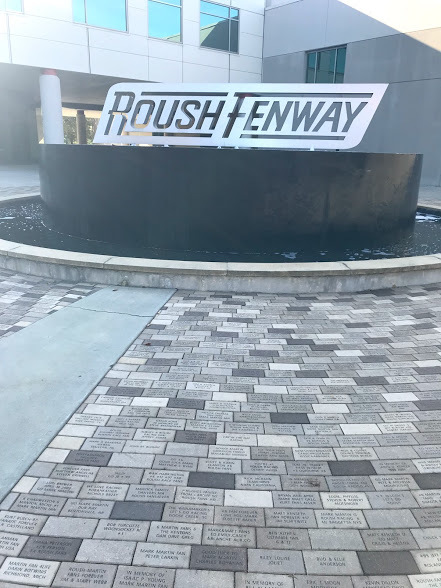 Upon arriving at the facility, we came upon a beautiful fountain that was adorned with dedication bricks. 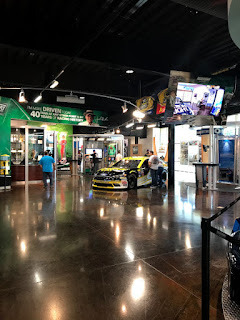 The shop was beautiful and very fan friendly. 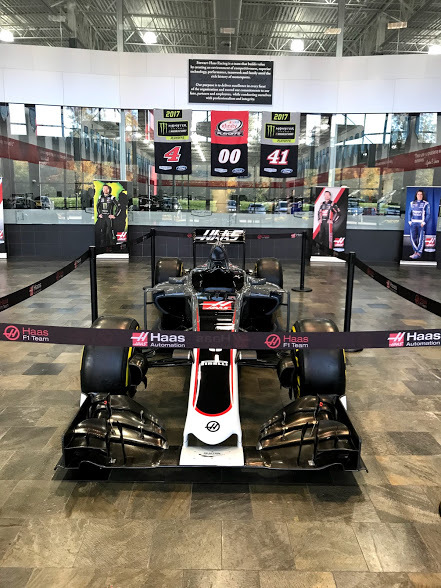 Many of the team uniforms, cars and trophies were on display there. Drivers that drive for and have driven for Roush Fenway at various levels include Ricky Stenhouse, Bubba Wallace, Ryan Reed, Trevor Bayne, Ty Majeski and Chris Buescher. 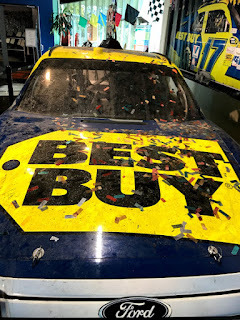 They had Ricky's car on display from his win at Daytona Coke Zero 400. It still had all of the rubber, scratches and confetti on it from the victory lane celebration. 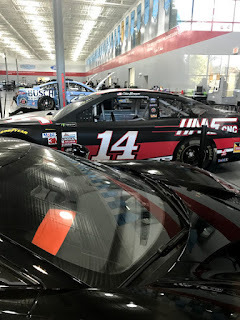 It was pretty cool to be up close to the car. 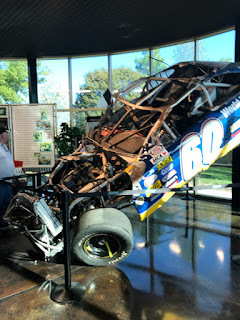 We saw the wrecked #60 ARCA vehicle of Todd Kluever from the 2005 Daytona 200 on display. 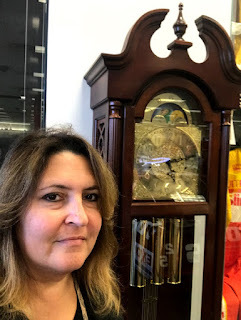 I found this shop to be fan friendly with a lot of interactive displays. 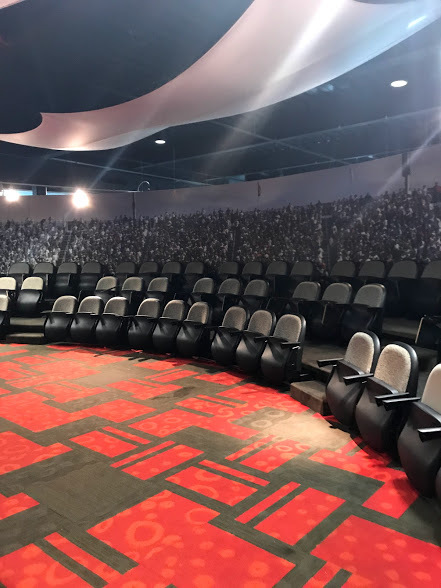 They even had a movie room with stadium style seating which played the film from Ricky Stenhouse's recent win along with commentating. 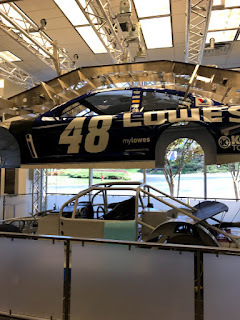 Our next shop stop was Hendrick Motorsports. This place was impressive. Located on Papa Joe Hendrick Blvd, behind his auto dealerships along Bruton Smith Blvd sits the buildings that make up Hendrick Motorsports. There are several buildings on the property, surrounded by a beautiful lake and pristine landscaping. 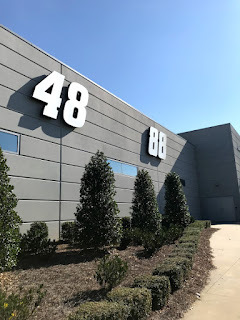 We visited 3 buildings on this property including, the museum, the 5 and 24 race shop, and the 48 and 88 shop. 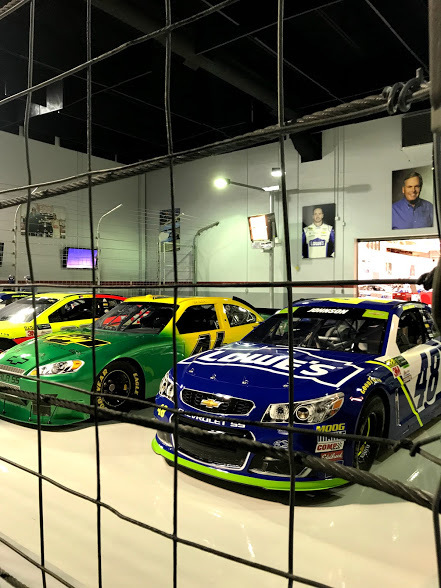 The museum displayed many vehicles and trophies that have been accumulated over the years by the many successful drivers that have driven for the Hendrick team over the years. 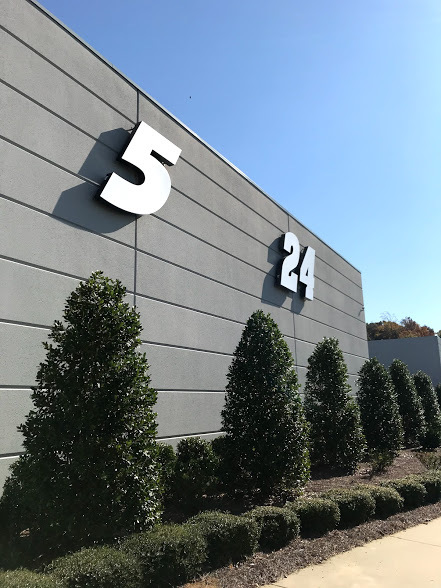 The next building we visited was the 5 and 24 car building. 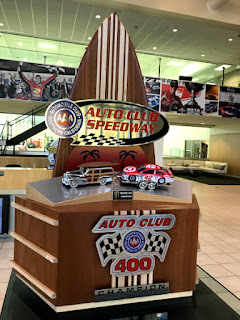 Here on display were many of the trophies won by Jeff Gordon and Terry Labonte. Situated between this building and 48/88 building was a beautiful water fountain with the names of the Hendrick family members, lost in the plane crash, displayed around the fountain, along with scriptures from the bible. 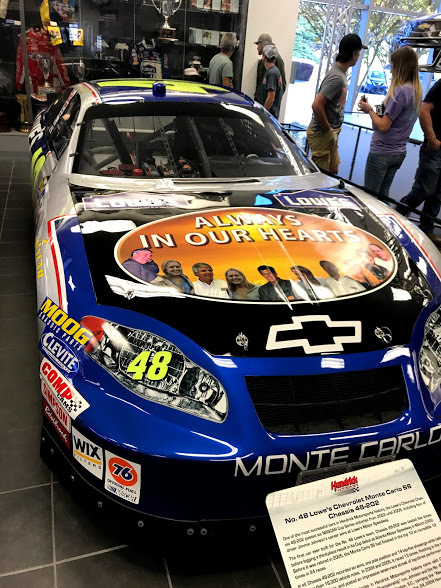 The vehicle that was dedicated to his family members which were killed in a plane crash sat prominently on display. There were also displays of Nascar vehicle parts and an impressive display that showed the inside of one of Jimmy Johnson's vehicles. 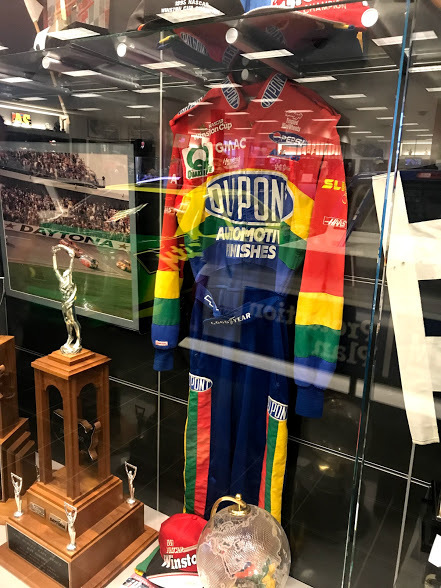 Also on display were some of Chase Elliot's gear. One wall that caught my eye had a display of every diecast vehicle from the Hendrick teams. Also on display is a Jimmie Johnson winning vehicle from 2011 which is for sale. 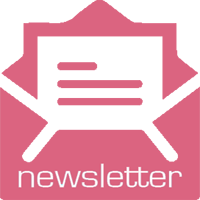 Interested in purchasing it? You can own it for $175,000. 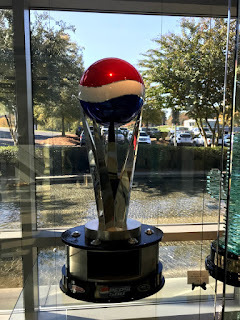 The 48/88 building was impressive with many of the trophies won by Jimmie Johnson, as well as vehicles driven by him and Dale Jr. One of my favorites was a Pepsi 500 trophy. 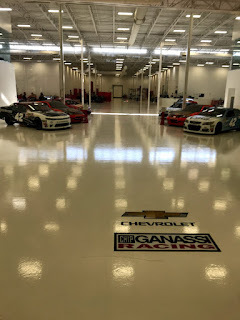 There was a room that we went into that had the race shop behind it, where they built and worked on the cars. On to the Nascar Hall of Fame. 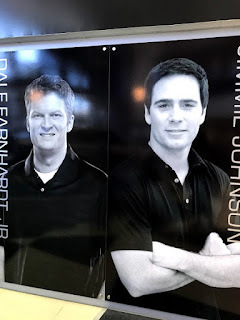 I was pretty excited to be visiting the Nascar Hall of Fame in Charlotte. The area was very pretty. It was like a mini New York. We parked in the parking garage that is attached to the HOF and walked around the block to the entrance. Inside, the first display that caught my eye was a display of some of the cars that formed what is now Nascar. They were set up on a track along the perimeter of the wall. 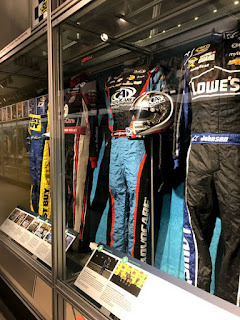 Also on display were many driver cars and uniforms. The museum is 4 floors. Each floor has interactive displays and many photos, films, trophies and memorabilia of the history of Nascar. 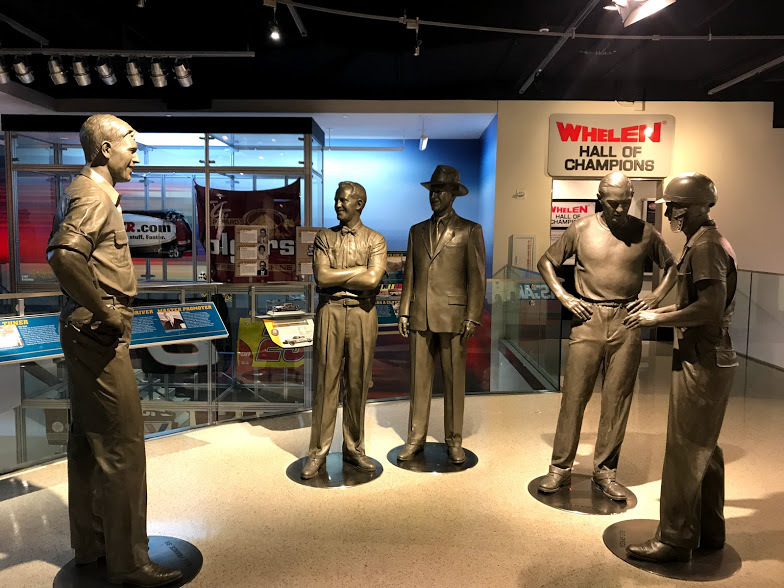 We posed for a few pictures in the museum and even tried the interactive tire changing display. I raced on an interactive track and did horrible. However, after trying several times, I finally qualified virtually. 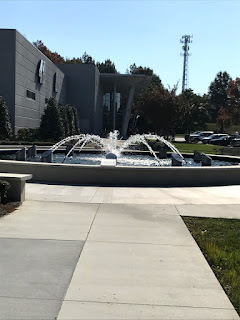 This is a wonderful museum and well worth the trip. 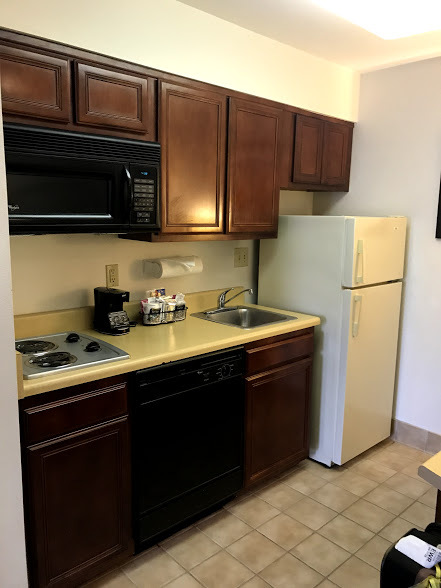 It is a great place for the entire family and there is something for everyone. We grabbed lunch there because we were starving by the time we were done. The HOF has a little cafe that serves BBQ style foods and there is also a Buffalo Wild Wings attached. 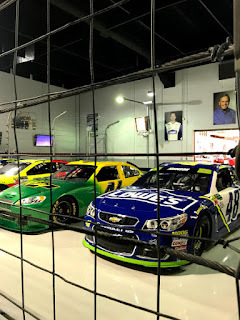 We did a brief tour of the Hall of Fame because we were pressed for time. However, we could've easily spent many more hours there. 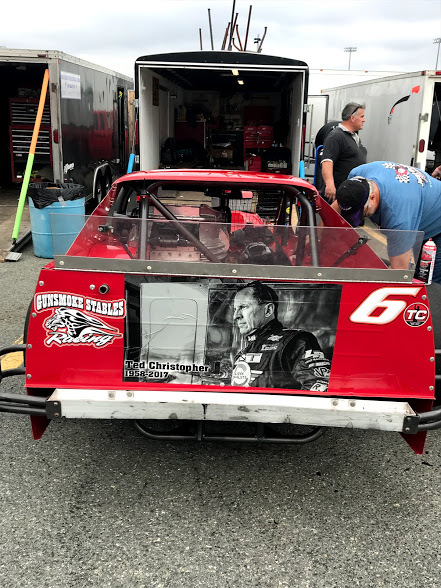 After leaving the Hall of Fame we headed back to the Dirt Track at Charlotte for night 2 of racing. The crowd on Night 2 was double of the first night. 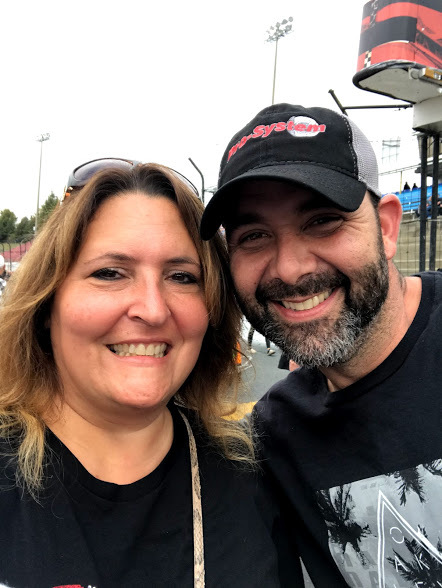 My husband and I got to the track a bit early and decided to walk around for a bit and have a couple of beers before settling down in our seats. 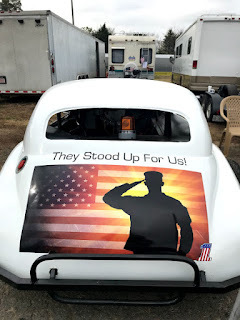 The racing was spectacular and the track was in great racing condition, dirt was flying everywhere! The racing was over by 11pm and we were ready for sleep by then, after such a long day. 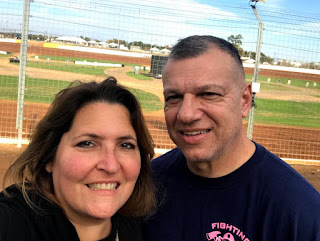 Today we decided to pull the double, which in racing terms means visiting 2 tracks in one day. The North South Shootout was taking place at Concord Speedway and was featuring the Tour Type Modifieds 125, as well as the PASS South Super Late Model series and other racing. 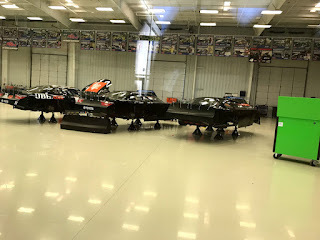 We got to the track early and visited the pits. 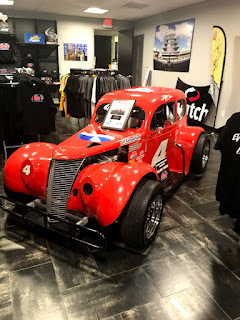 I got to meet a lot of great drivers, including up and coming racers Ryan Preece and Ty Majeski, as well as the Myers Brothers, Jason and Burt, of the Madhouse television series. I also saw an all time favorite, Jaime Tomaino, who I use to watch race locally in NJ. He is a great guy and was very friendly. 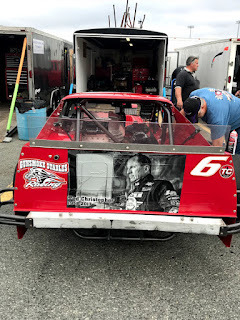 The race was paying tribute to Ted Christopher, who recently lost his life in a plane crash, in Connecticut on his way to a track, and to John Blewett III, who was killed while racing in Connecticut at Thompson Speedway. Many drivers had tributes on their vehicles. 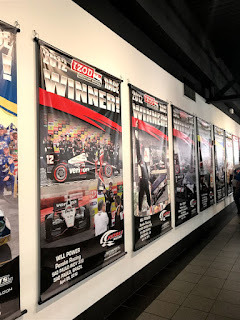 All of the fans were invited onto the track, with the cars and drivers lined up and ready to pose for pictures and hand out autographed cards. It was very much appreciated by all. After the race, we rushed back over to the Dirt Track at Charlotte for the final night of racing for the World Finals. 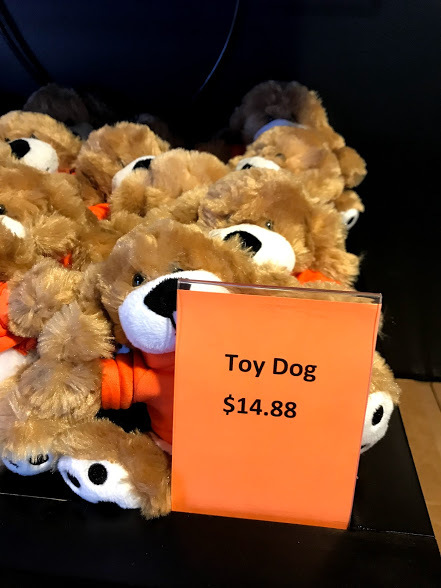 The excitement was all around us and the crowd was even larger than the previous two nights, with Standing Room Only tickets being sold at the ticket booths. Luckily we had our weekend reserve seats already. 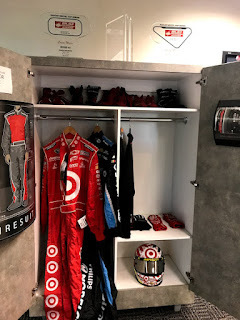 We took a walk along the tee shirt trailers and visited some friends before heading to our seats. 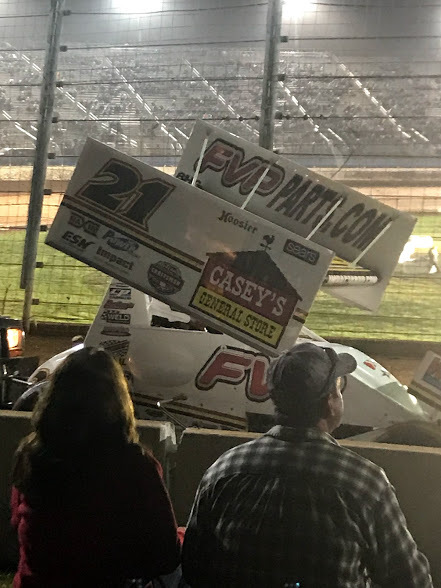 Seeing the opening ceremonies for the night and watching all of the cars go four abreast around the track was surely one of the highlights of the weekend. The pyrotechnics added to the excitement. The racing was fantastic and the track provided a slick surface for a lot of passing. 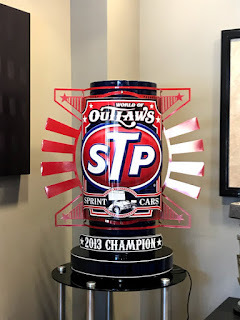 David Gravel passed Donny Schatz on the last lap for the victory in the sprint car race. The crowd was on their feet cheering with elation. 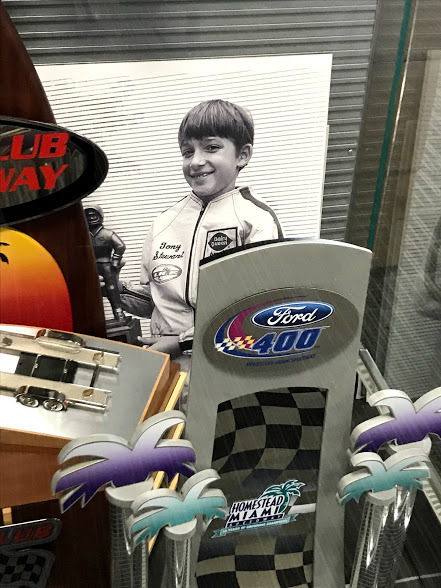 Donny was going for his 250th Outlaw win and many were rooting for him to get it. They will have to wait until the 2018 season to see that achievement. 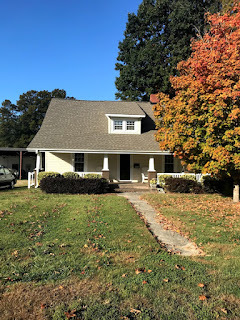 We had such a great time in North Carolina. I would love to go back one day again. Until then, I have Volusia, Florida, Mid Ohio and Myrtle Beach on my list of racing destinations.